They were found in Mexico. 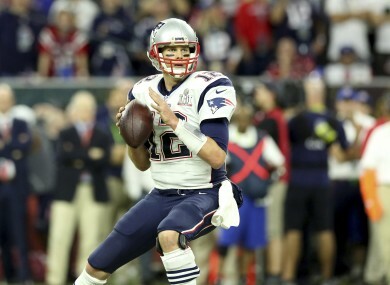 TWO SUPER BOWL jerseys stolen from New England Patriots quarterback Tom Brady, one last month in Houston and the other from the 2015 game, have been recovered. Brady took the Super Bowl Most Valuable Player award in New England’s 34-28 overtime victory over the Atlanta Falcons last month as well as the Patriots’ 28-24 victory over Seattle in suburban Phoenix, Arizona, in 2015 when the previously unknown missing jerseys was taken. An FBI-led investigation found both jerseys in Mexico and they are in the process of being authenticated by authorities, Houston Police Chief Art Acevedo said. “The items were found in the possession of a credentialed member of the international media,” the NFL announced in a statement. “Through the cooperation of the NFL and New England Patriots’ security teams, the FBI and other law enforcement authorities, the Super Bowl 51 jersey worn last month by MVP Tom Brady has been recovered. Several media reports after the announcements identified the person who allegedly took the jerseys as Mauricio Ortega, a former executive with Mexico’s Diario La Prensa. Houston police had listed the Super Bowl 51 jersey, which was missing for six weeks, as worth $500,000. The league said an FBI investigation was ongoing. A video on the NFL’s website showed Brady’s shock at learning his jersey was missing. Brady, 39, completed 43-of-62 passes for 466 yards — all Super Bowl records — in rallying the Patriots from a 28-3 deficit to defeat Atlanta, becoming the first quartrback to win five Super Bowls. Email “Tom Brady's stolen Super Bowl jerseys found after FBI-led investigation ”. Feedback on “Tom Brady's stolen Super Bowl jerseys found after FBI-led investigation ”.